Is EPA caving to pressure on fracking probes as Obama pushes gas as balm for climate change? "Environmentalists see an [Environmental Protection] Agency that is systematically disengaging from any research that could be perceived as questioning the safety of fracking or oil drilling, even as President Obama lays out a plan to combat climate change that rests heavily on the use of natural gas," Abrahm Lustgarten reports for Pro Publica. That wasn't the only time the agency backed away from a fracking investigation. "Over the past 15 months the EPA closed an investigation into groundwater pollution in Dimock, Pa., saying the level of contamination was below federal safety triggers and abandoned its claim that a driller in Parker County, Texas, was responsible for methane gas bubbling up in residents’ faucets, even though a geologist hired by the agency confirmed this finding," Lustgarten reports. They also "sharply revised downward a 2010 estimate showing that leaking gas from wells and pipelines was contributing to climate change, crediting better pollution controls by the drilling industry even as other reports indicate the leaks may be larger than previously thought, and failed to enforce a statutory ban on using diesel fuel in fracking." Despite nearly dying, Baker has no plans to stop working on grain bins, or even going back into one if necessary, Klingseis reports. “I’m going to be a farmer the rest of my life. I need to get used to going into grain bins. I will take a little extra safety precautions, but it still has to be done.” (Read more) Grain-bin injuries and fatalities have remained steady as other farm-related casualties have declined, and prosecutions for violations of safety rules are rare. Once the prisoners are moved, Kentucky will no longer house any of its inmates in private prisons; one prison houses inmates from Vermont. With the relocation of 1,807 inmates, 166 employees will lose their jobs and the county stands to lose a considerable amount, Lega reports. From August 2012 to May 2013 the center spent nearly $1.77 million with Marion County businesses, including $32,497 for advertising with the Enterprise, a Landmark Community Newspapers Inc. weekly. The facility also provided more than $132,000 in revenue for the county water district in the past year, invested $250,000 to help start a sewer project, and pays between $18,000 to $21,500 per month for sewer service. Also, the county gets about $52,700 a year in occupational taxes from the facility. Families of inmates also bring money to the county when they visit, and "the prison's community service workers provided more than $34,000 in savings to the Department of Transportation and the community during the first six months of 2013," Lega reports. State parks are facing mushrooming backlogs of repairs, ranging from $1 billion in California to $750 million in Illinois to $400 million in Missouri, Cooper reports. Without proper funding, the condition of state parks has suffered. The American Society of Civil Engineers this year gave the U.S. a C-minus for the condition of its park infrastructure, saying "states and local governments can’t keep up with recreational needs because of shrinking budgets." The group says the amount of money states need just isn't available, with federal data showing states are asking for $18.5 billion for outdoor recreational facilities, Cooper writes. As a result, states are trying to make up the money by increasing fees. Illinois, which has a park-repair backlog of $750 million, has raised license-plate renewals by $2. Kansas, which has a backlog of $26 million and a state park budget of $10.6 million for this fiscal year, is offering discounts on annual state-park passes when drivers register their cars. More rural residents of Minnesota are getting the chance to experience the benefits of broadband Internet. The $6.6 million Minnesota Intelligent Rural Communities program was designed to boost rural broadband by helping people find online resources to better their lives. The recently completed program has already helped 250,000 rural Minnesotans get introduced to online resources for jobs, continuing their education, and strengthening their businesses, reports the Grand Rapids Herald Review, north of Minneapolis. The program "leveraged resources of coalition partners to extend small business technical assistance and training, distribute refurbished computers to low-income families, train individuals and businesses, and create and deliver courses for knowledge workers," reports the Review. As part of the program 11 communities received $100,000 "to identify and implement nearly 100 projects that fit local broadband needs and helped communities boost their overall ability to participate in the Internet-based economy." In the 11 communities the subscription growth rate for broadband services increased from 10.3 to 15.9 percent. If you're in a struggling industry at a time when the country has become politically polarized, being identified with a political party is not good business. 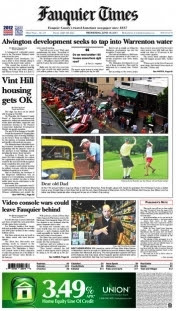 That's what the twice-weekly Fauquier Times in Northern Virginia horse country said when it abandoned the name "Fauquier Times-Democrat" June 19. "In an age which is, perhaps, more shaped and informed by political identity than any other in our history, having a word in our banner that is so associated with a political party is no longer a very astute business decision," Executive Editor Bill Walsh explained to readers in an editorial. The 14,000-circulation paper is part of Times Community News, a family-owned chain. The Warrenton newspaper, founded in 1817, adopted the partisan name 40 years after the end of the Civil War, when rural Virginia was firmly Democratic. But now Fauquier County is reliably Republican, and Walsh said the paper's circulation department concluded the "Democrat" was a drag, even though the paper is editorially independent and its last presidential endorsement went to Republican Sen. John McCain in 2008. "Depp’s claims of Cherokee heritage (put forth in 2002 on "Inside the Actors' Studio", although in 2011 speaking to Entertainment Weekly he added 'or maybe Creek'), along with his streaked black-and-white painted face and a stuffed crow perched atop his head, have caused many to cry foul," Angela Aleiss reports. On a more recent program, Depp added Chickasaw to the list of possibilities. All are plausible; he is from Owensboro, Ky., on the lower Ohio River. In the film, he plays a Comanche. "Native American leaders and educators are not buying it," Aleiss writes, quoting Hanay Geiogamah, a professor at UCLA’s School of Theater, Film and Television, who was was a consultant for Disney’s "Pocahontas" and a producer for TBS’ "The Native Americans: Behind the Legends, Beyond the Myths." Geiogamah, a Kiowa and Delaware, told her, "Disney relies upon the ignorance of the public to allow that ambiguity to exist. 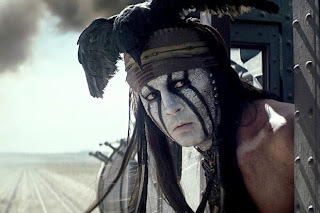 If Depp had any legitimate blood of any tribe, Disney would definitely have all the substantial proof of that already. It’s not that hard to establish tribal connections." Speed limits were raised from 65 mph to 70 on several stretches of interstates in Ohio on Monday, and the next day New Hampshire Gov. Maggie Hassan signed the state's first speed limit increase in 40 years, raising a stretch of highway from 65 to 70. Maine and Utah have also raised limits this year, and other states may do so, Governing magazine reports. Hassan said she decided to sign the New Hampshire bill because it received overwhelming bipartisan support in the legislature and was limited to certain roads, Kevin Landrigan reports for The Telegraph, located in Nashua, in the southern part of the state. "As of Jan. 1, the speed limit will be 70 mph for about an 80-mile stretch of I-93 north of Canterbury up to the border with Vermont," Landrigan reports. "Currently, motorists can drive up to 65 mph on this stretch of road. The only part of the route not covered by the increase is about 5 miles that go through the White Mountain National Forest and Franconia Notch, where the speed limit will remain 45." If the world's population continues to grow at its projected rate, and crop yields remain as expected, by 2050 there won't be enough food to feed the world, Population is expected to grow from 7 billion today to 9.6 billion in 2050, but a University of Minnesota study "found that crop yields haven’t been rising at a sufficient pace to meet projected demand by 2050," Brad Plumer reports for The Washington Post. The study was published in PLOS One, the journal of the Public Library of Science, which describes itself as "organization of scientists committed to making the world's scientific and medical literature freely accessible to scientists and to the public." A federal raid of a meatpacking plant in the small town of Postville, Iowa, in 2008 may have been the catalyst for putting the need for immigration reform back in the national spotlight, and for creating a new breed of journalists who became experts at covering the immigration debate, especially from the human-interest point of view, Deron Lee reports for Columbia Journalism Review. The raid led to the arrest of 400 workers, who were the victims of deplorable working conditions, and ended up getting caught in the justice system, where they were separated from their families, imprisoned, and deported. 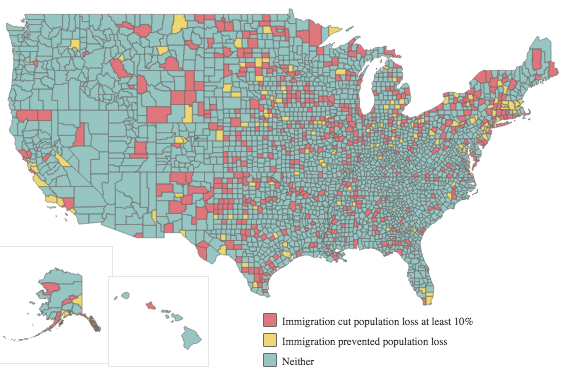 The raid decimated the town’s immigrant-heavy population, and its economy, Lee reports. Trish Mehaffey, who covered the fifth anniversary of the raid last month for The Gazette in Cedar Rapids, told Lee: “I think the Postville raid brought to light the fact that there needed to be changes, because it kind of ruined that town. It really opens your eyes to see how something like that can affect a whole community." Libertarian-oriented foundation says North Dakota still has best state highways in the U.S.
North Dakota continues to have the best state-owned highway system in the country, according to the libertarian-oriented Reason Foundation's 20th "Annual Report of the Performance of State Highway Systems." Highways were rated based on expenditures, interstate and primary road pavement condition, bridge condition, urban interstate congestion, fatality rates and narrow rural lanes. The study was based on spending and performance data submitted by state highway agencies to the federal government, according to a Reason news release. North Dakota, which has held the top spot every year since 2001, was followed by Kansas, Wyoming, New Mexico, Montana, Nebraska, South Carolina, Missouri, South Dakota, and Mississippi. Alaska was 50th and Rhode Island was 49th. Those two states (the largest and smallest in area) reported more than 10 percent of their rural primary mileage to be in poor condition. The percentage of road miles in a state that are the responsibility of the state varies widely. To view the full report click here. Senate elections in 2014 include open seats in West Virginia and South Dakota now held by Democrats, and elections in energy-rich Louisiana, where Democratic incumbent Mary Landrieu is on shaky ground, and Kentucky, where Secretary of State Alison Lundergan Grimes said yesterday she is taking on McConnell, the Senate GOP leader and a top target of Democrats. He would like to become majority leader; to do that, his party would need a net gain of six seats. Following Obama's climate-change speech last week, Republicans immediately went on the attack against Democratic House members in mining states, and Democratic candidates like Nick J. Rahall II of West Virginia are trying to distance themselves from the president, Fears reports. But Republicans are trying to link Democratic candidates to Obama and his speech, to get the upper hand. After Grimes announced she was immediately attacked by national Republicans as being joined at the hip to the president in a “desire to destroy the coal industry." Rahall sounded nearly as hostile as the billboards dotting coal country bought by mining interests that declare “Obama’s No Jobs Zone,” saying he was “profoundly disappointed” by the president’s new initiative, Fears reports. Rahall said “I’m not ever, ever, ever going to back away from fighting for our coal miners." Fourteen new disposal wells have been drilled in Ohio since last year, giving the state 191, compared to 63 in West Virginia and seven in Pennsylvania, Hunt reports. "There also is little that state officials can do to keep out-of-state waste from Ohio wells. Federal commerce protections forbid one state from imposing tariffs or bans on legally shipped commodities from other states." The U.S. Fish and Wildlife Service recently announced that two species -- the rockland grass skipper and the Zestos skipper -- are probably extinct in South Florida, Fears reports. At least one species has vanished from the U.S., another 17 species and subspecies are listed as endangered nationwide, and two are listed as threatened. Atheist marker, stemming from settlement of Ten Commandments lawsuit, is called the first in U.S.
Atheists now have a monument, and place to rest, in Florida. And they say they intend to do likewise in every state. American Atheists "sued Bradford County in May 2012, soon after the Ten Commandments monument was erected in front of the courthouse, seeking the monument's removal," Watkins reports. "The Community Men's Fellowship, a Starke-based group that sponsored the religious monument when it was erected, refused the county's request that it remove the display and filed its own lawsuit. During court-ordered mediation, the groups settled on an agreement: The Ten Commandments monument could stay, but American Atheists would establish their own monument in kind." 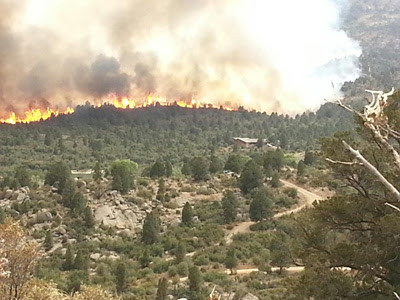 The Granite Mountain Hotshots are the only widlfire-fighting team in the U.S. "organized through a city fire department," Whitehurst reports. "It earned its national inter-agency hotshot designation in 2008. Prescott Fire Department Fire Chief Dan Fraijo said the 20th crew member was working in a different location on the fire and was not injured." Frajo said, "We're devastated. We just lost 19 of the finest people you'll ever meet. ... Truly, we're going through a terrible crisis right now." 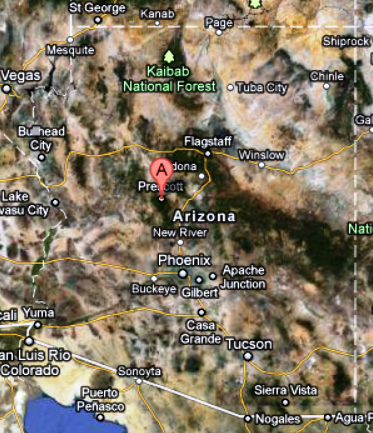 Prescott's population is about 40,000. "Sunday's fatalities amounted to the highest firefighter death toll on a single U.S. wildfire since 1933, when 25 firefighters were killed on the Griffith Park fire in Los Angeles," Whitehurst reports. At the bottom of his story are links to other coverage by the Daily Courier, and many reader comments. In a good example of local reporting on the relationship between gas companies and rural landowners, The Herald of Sharon, Pa. has a story about how gas company fees in the Marcellus Shale region are cutting into royalty payments for landowners who allow drilling on their property, and landowners are being seriously shortchanged while gas companies make huge profits, reports John Finnerty, state-capital correspondent for Community Newspaper Holdings Inc.
Republican Sen. Gene Yaw, chairman of the Senate Environmental Resources and Energy committee, said “In some cases, these costs have caused royalty payments to be as low as 1.47 percent, well below the 12.5 percent guaranteed minimum,” Finnerty reports. Yaw told him problems with confusing or ambiguous royalty stubs and excessive post-production cost deductions have significantly impacted many leaseholders. The Pennsylvania Farm Bureau looked into allegations, finding that one well produced $41,861 worth of gas, but Chesapeake Appalachia deducted $28,249 before making a royalty payment of $13,611, Finnerty reports. "In another case, the gas company post-production deductions consumed 88 percent of the royalty payment. The well had produced $14,481 worth of gas. The company deducted $12,790, leaving the landowner with a royalty payment of $1,690." Kimberly Quiros, director of communications for the National Volunteer Fire Council, said there is no nationwide, mandatory training for volunteer firefighters to fight fertilizer-based fires, Quinn reports. She said some states may offer optional training, but she was not aware of any state mandated fertilizer fire training. Quiros said, "It is up to the states for specialized training like fighting fertilizer fires. And not only does training vary from state to state, but also community to community within a state depending on what is in their areas." The group Coal Mining Our Future was created "to ensure that citizens are informed about coal industry activities," according to its mission statement "The group sponsors pro-coal rallies, encourages letters and phone calls to politicians, conducts surface mine tours to show the usefulness of flat land, makes charitable donations and distributes pro-coal T-shirts and bumper stickers, such as the now-ubiquitous decal declaring 'If you don't like coal, don't use electricity'," Cheves and Estep report in the latest installment of a year-long series on Appalachian Kentucky that began in December. It's all part of an "us versus them" mentality, uniting miners behind their bosses, something new in the coalfield, Al Cross, director of the Institute for Rural Journalism and Community Issues at the University of Kentucky, told Cheves. Coal operators "are in a defensive mode, and they're gathering their friends around them. This has created, I think, kind of a siege mentality and a regional solidarity. There used to just be sympathy for miners. Now there is sympathy for an industry," Cross said in March speech entitled "From Villain to Victim: The Coal Industry's New Image in Appalachian Kentucky." In his column yesterday in The Courier-Journal, drawing from President Obama's plan to thwart climate change, Cross said "The industry has played political ju-jitsu with Obama’s policies, turning its public image from one of environmental and workplace villain into one of political victim. . . . Now there really is a war on coal." The Lake County News of Northern California won a lawsuit against the county, after a judge determined that Sheriff Frank Rivero (Sacramento Bee photo by Randall Benton) discriminated against the online-only newspaper by refusing to provide public information, reporter Patrick Boylan writes. The county will have to pay $110,990 in attorney fees and court costs. The News's attorney said Rivero didn't like what it was printing about him and decided to cut it off, requiring it to use the California Public Records Act to obtain documents that had already been released to other news media, Boylan writes. The News also had to go to the sheriff's office and pay for copies that were free to other local news outlets. The daily newspaper in the county is the Lake County Record-Bee, owned by MediaNews Group. In an email to the Press Democrat in Santa Rosa, Rivero said, “To the extent that the judge used his discretion to award attorney’s fees to a non-prevailing party, I believe that exceeded his authority." Rivero said he plans to appeal. Meanwhile, citizens in Lake County have begun a recall campaign against him, needing 7,026 signatures by Aug. 15. (Read more) The group circulating petitions reported June 20 "it had more than 90 percent of the signatures needed to get a recall election on the ballot," Jeremy Walsh of the Record-Bee reports. The Department of Agriculture has agreed to inspect a New Mexico slaughterhouse that plans to process horse meat for human consumption, a move likely to set off another round of battles over whether horse abattoirs can operate legally in the U.S.
Valley Meat Co. of Roswell, N.M., waited more than a year to get the go-ahead from USDA, which gave it only grudgingly, saying the law required it to issue a "grant of inspection" because it had met all the requirements, Charles Abbott of Reuters reports, adding: "The USDA also said it may soon issue similar grants for plants in Missouri and Iowa." UPDATE: Agri-Pulse reports, "The other companies expected to receive USDA inspection permits are Rains Natural Meats in Missouri and Responsible Transportation in Iowa." UPDATE, July 3: Responsible Transportation, in Sigourney, said it has received a grant of inspection, and the Rains plant, in Gallatin, Mo., "reportedly could receive a permit this week," Julie Harker reports for Brownfield. USDA's move could prompt a blocking move in Congress, where members of both parties join with President Obama in opposing horse slaughter. Congress effectively banned it from 2007 to 2011 by denying money for inspections, but lifted the ban after a study showed that it had removed the bottom from the horse market and worsened the problem of horse abandonment and neglect. An estimated 130,000 U.S. horses are shipped annually to slaughter in Canada and Mexico," Abbott reports. Horse meat is sold for human consumption in several other countries, "and is sometimes used as feed for zoo animals. But in the United States, horses enjoy a higher stature, more akin to house pets, than to hogs, cattle and chickens." Abbott notes, "The Humane Society of the United States and Front Range Equine Rescue threatened on Friday to sue the USDA, saying horses are raised as pets and as working animals. Because they are not intended as food animals, horses are given medications banned from other livestock, the groups said, questioning if the meat would be safe. The USDA says it can test for residues of 130 pesticides and veterinary drugs." (Read more) On Friday, USDA's Food Safety and Inspection Service updated its instructions for inspection of slaughtered horses; a PDF is here.